I absolutely hate when I get into the shower after a long day of work and find a clog in the drain, again! I have long hair and I use a hair catcher to catch as much as I can, but some inevitably get past that. Then the scum from shampoo and conditioner starts to build up around that, creating clogging issues. Gross! Tip: if your drain isn’t clogged but it stinks, use lemon peels to freshen it. If hair was the only problem in a clogged drain, you could use an alkali to destroy the hair. But the oily and waxy nature of shampoo, conditioner, soap, body wash, deep hair treatment, etc., all goes down the drain and complicates the problem. The hair becomes caught on pipe connections and drain fittings, then the hair catches the other things. Further, when you consider the water load that flows through them, the diameter of the drain pipes is too narrow. The average shower is over 8 minutes and uses nearly 20 gallons of water, most of which is cool by the time it hits the pipes. The average bath is more, usually around 30 gallons of water. If you have clogged drains and want to avoid dumping chemicals down them, consider using more these homemade natural drain cleaner methods. Plumbers and government conservation organizations agree; vinegar, baking soda, and boiling water clear clogged drains. Drain cleaner: Plunger, followed by a handful of baking soda and a half cup of vinegar. Cover and allow to sit for 15 minutes. Pour in 2 quarts of boiling water, and the clod should disappear. Baking soda is sodium bicarbonate, a base. Vinegar is made up of water and acetic acid, which is, you guessed it, an acid. When you combine these, a reaction happens where molecules get exchanged, creating carbon dioxide and water that bubbles through the clog, breaking it up and moving the looser material. Let them react and wait another 10-15 minutes. Next, after the baking soda vinegar reaction has ceased to fizz, carefully pour in the pot of boiling water. 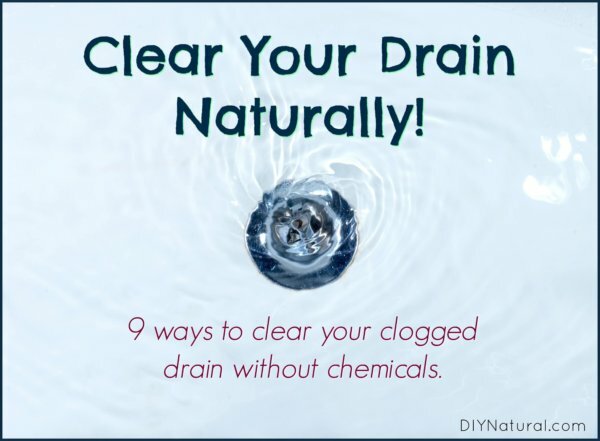 Here are a few homemade natural drain cleaner ideas that will clear a clogged drain quickly, without the harsh chemicals! Using hot water will melt a lot of the oily, waxy components of conditioners and body oils. If using a lot of coconut oil or other waxy products in your routine, be sure to let the hot water run for a while to melt it away. Sometimes things, like cotton balls, get stuck in drains. A plunger may help to loosen up whatever is down there. Additionally, sometimes a hair clog will just need some plunging to get it to move through the pipes. I’m not sure of the official name of this tool, but it looks like really skinny fish bones. Insert it into the drain, twist to get a hold of the hair, and pull out. The hair you pull out will be slimy, so you might want to use gloves. 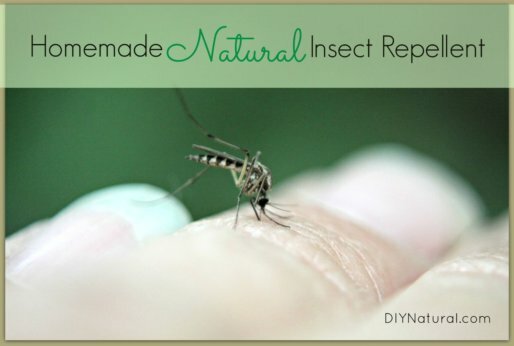 This is a really popular and effective homemade and natural drain cleaner idea. Pour about ½ cup of liquid soap down the drain and wait 5 minutes so that the soap can get down into whatever is in the drain. Then CAREFULLY pour boiling water into the drain, being sure it doesn’t splash and burn you. Shape the end of a coat hanger into a U shape. Push this down into the drain and pull out. It will bring hair with it and help you to get that drain cleaned. If there is something in the drain that you can’t remove with the above methods, you may need to take it apart. Many newer homes have a trap door built right in back of the faucet and drain on a tub for just this reason. It goes without saying that if you try all of this and nothing works, you may need to call a plumber. But why not try it yourself first? Have you ever used homemade natural drain cleaner methods? If so, what works for you? Reduce Your Use of Hazardous Household Products by Choosing Safer, Less-Toxic Products. USDA Natural Resouces Conservation Service. This is how I clean my drains and it works wonderfully! No need for harsh chemicals. I invite all of you to try this method. Do it on a regular basis. We need to save our planet and our health. One other method is to use something to catch hair BEFORE it goes into the drain. My family and I use a tubshroom, which catches hair and lets water through. I just pull it out of the shower/tub drain once a week, remove the hair, and it’s all taken care of. That’s also a good one, prevention is better than cure. I read in another post about cleaning with baking soda and vinegar that said they cancel each other’s cleaning power out – even though you get the fizz effect. What really is doing the cleaning of the pipes is the very hot (not boiling) water that is melting the scum away not the baking soda or vinegar. I’m going to try just hot water for a while and see if it works as well. That may be true, Robin, but sometimes the fizz is all you need to loosen up a clog. And hot water really works in some cases! Thanks for the information, Josette! I have one of those, but I never thought about it breaking. My former roommate was from China and had very long black hair that was always getting caught in the drain. I used this thing all the time. I’ll be keeping a better eye on it now! About once a month a use the baking soda/vinegar routine just to clean and freshen my drains.